Source: Latin, 6th or 7th cent. 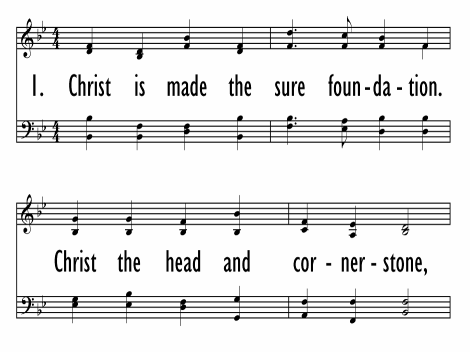 Display Title: Christ Is Made the Sure Foundation First Line: Christ is made the sure foundation Tune Title: WESTMINSTER ABBEY Author: John M. Neale, 1818-66 Meter: 87 87 87 Date: 1993 Subject: Church | Source: Latin hymn, c. 8th century, abr. Display Title: Christ Is Made the Sure Foundation First Line: Christ is made the sure foundation Tune Title: LAUDA ANIMA Author: J. M. Neale, 1818-66 Meter: 87 87 87 Date: 1996 Subject: Invocation | Source: Latin, 6th or 7th cent. 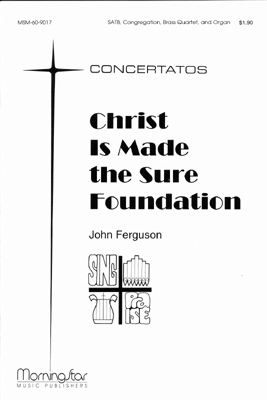 Display Title: Christ Is Made the Sure Foundation First Line: Christ is made the sure foundation Tune Title: ST. THOMAS Author: John M. Neale, 1818-1866 Meter: 8 7 8 7 8 7 Scripture: Psalm 118:22; Matthew 21:33-43; 1 Corinthians 3:11; Ephesians 2:23-22; 1 Peter 2:4-6 Date: 2011 Subject: Dedication of a Church | ; Anniversaries | ; Blessing | ; Church | ; Communion of Saints | ; Ecuminism | ; Gathering | ; Hope | ; Jesus Christ | ; Love of God for Us | ; Petition/Prayer | ; Praise | ; Saints | ; Trust | ; Unity | Source: 11th C.
Display Title: Christ Is Made the Sure Foundation First Line: Christ is made the sure foundation Tune Title: ST. THOMAS Author: John M. Neale, 1818-1866 Meter: 8 7 8 7 8 7 Scripture: Psalm 118:24; Matthew 21:33-43; John 2:13-25; John 3:16; 1 Peter 2:4-6 Date: 1994 Source: 11th C.
Display Title: Christ Is Made the Sure Foundation First Line: Christ is made the sure foundation Tune Title: ST. THOMAS Author: John M. Neale, 1818-1866 Meter: 8 7 8 7 8 7 Date: 2004 Subject: Dedication of a Church | ; Christian Initiation | Source: Latin, 11th C.
Display Title: Christ Is Made the Sure Foundation First Line: Christ is made the sure foundation Tune Title: WESTMINSTER ABBEY Author: John Mason Neale Meter: 8.7.8.7.8.7 Scripture: 1 Kings 8:27-30; Psalm 18:6; Matthew 21:42; Mark 12:10; Luke 20:17; John 2:13-16; Acts 4:11; 1 Corinthians 3:11; Ephesians 1:22-23; Ephesians 2:20-22; Colossians 1:18; 2 Timothy 2:12; 2 Timothy 2:19; 1 Peter 2:4-7; Revelation 21 Date: 2013 Subject: Christian Year | All Saints; The Church | ; Eternal Life | ; Gathering | ; Teaching/Education | ; The Triune God | Source: Latin, 7th cent. Display Title: Christ Is Made The Sure Foundation First Line: Christ is made the sure foundation Tune Title: WESTMINSTER ABBEY Author: John M. Neale, 1818-1866 Meter: 8 7 8 7 8 7 Scripture: Psalm 118:24; Matthew 21:33-43; John 2:13-25; John 3:16; 1 Corinthians 3:11; Ephesians 2:20-22; 1 Peter 2:4-10 Date: 1991 Subject: Affirmation of Baptism | ; Anniversary, Church | ; Church | ; Comfort | ; Community in Christ | ; Dedication of a Church | ; Eternal Life | ; Holy Baptism | ; Jesus Christ | ; Lent | ; Life, Everlasting | ; Love of God for Us | ; Praise, Adoration | ; Trust | ; Unity | ; Witness | Source: Latin, 11th C.
Display Title: Christ Is Made the Sure Foundation First Line: Christ is made the sure foundation Tune Title: WESTMINSTER ABBEY Author: John M. Neale, 1818-66 Meter: 87 87 87 Scripture: Revelation 21; 1 Peter 2:5-7; Ephesians 2:20-22; Isaiah 28:16 Date: 1998 Subject: The Church | ; Anniversary, Church | ; The House of God | Source: Latin hymn, c. 7th cent. Display Title: Christ Is Made the Sure Foundation First Line: Christ is made the sure foundation Tune Title: REGENT SQUARE Author: John M. Neale, 1818-1866 Meter: 8.7.8.7.8.7 Scripture: 1 Corinthians 3:11 Date: 2007 Subject: Adoration and Praise | ; Assurance | ; Blessing | ; Church | ; Comfort | ; Ecumenism / Interfaith | ; Hope | ; Love | ; Opening of Worship | ; Trinity | Source: Latin, 7th C.
Display Title: Christ Is Made the Sure Foundation First Line: Christ is made the sure foundation Tune Title: WESTMINSTER ABBEY Author: John Mason Neale Meter: 8.7.8.7.8.7 Date: 2017 Subject: The Church | Source: Latin hymn, 7th cent. Display Title: Christ Is Made the Sure Foundation First Line: Christ is made the sure foundation Tune Title: WESTMINSTER ABBEY Author: John Mason Neale, 1818-1866 Meter: 8.7.8.7.8.7 Scripture: Matthew 16:13-20; Isaiah 28:16-19; Ephesians 2:19-22; Numbers 6:22-27; 2 Corinthians 13:14; Revelation 4 - 5 Date: 2013 Subject: The Church | ; Doxologies | ; Elements of Worship | Opening of Worship: Called And Gathered Source: Latin, ca. 8th c.
Display Title: Christ Is Made the Sure Foundation First Line: Christ is made the sure foundation Tune Title: WESTMINSTER ABBEY Author: John Mason Neale, 1818-66 Meter: 87 87 87 Scripture: Ephesians 2:20-22; Ephesians 4:15-16; 2 Chronicles 6:18-21; Revelation 21:1-4 Date: 2006 Subject: Beginning of Service | Source: Latin, c. 8th cent. Display Title: Christ Is Made the Sure Foundation (Cristo, Firme Fundamento) First Line: Christ is made the sure foundation (Cristo, firme fundamento) Tune Title: WESTMINSTER ABBEY Author: John M. Neale, 1818-1866; Alberto Merubia, b. 1919 Meter: 8 7 8 7 8 7 Scripture: Psalm 118:19-24; Matthew 21:33-43; 1 Corinthians 3:11; Ephesians 2:20-22; 1 Peter 2:4-6 Date: 2013 Subject: Dedication of a Church | ; Dedicación de una Iglesia | ; Alabanza | ; Praise | ; Amor de Dios para Nosotros | ; Love of God for Us | ; Aniversarios | ; Anniversaries | ; Bendición | ; Blessing | ; Church | ; Iglesia | ; Communion of the Saints | ; Comunión de los Santos | ; Confianza | ; Trust | ; Ecumenism | ; Ecumenismo | ; Esperanza | ; Hope | ; Gathering | ; Reunión, Entrada | ; Jesucristo | ; Jesus Christ | ; Petition/Prayer | ; Súplica/Oración | ; Unidad | ; Unity | Source: 11th C.
Display Title: Christ Is Made the Sure Foundation First Line: Christ is made the sure foundation Tune Title: CHRIST CHURCH Author: John M. Neale Meter: 8.7.8.7.D. Scripture: 1 Corinthians 3:11; 2 Timothy 2:19; Ephesians 2:20-22; 1 Peter 2:4-7 Date: 1990 Source: Latin hymn, c. 7th C.
Display Title: Christ is made the sure foundation First Line: Christ is made the sure foundation Tune Title: WESTMINSTER ABBEY Author: John Mason Neale, 1818-66 Meter: 87.87.87 Scripture: 1 Corinthians 3:11-15; 1 Kings 7:22-51; 1 Peter 2:1-8; 2 Chronicles 6:12-40; Ephesians 2:18-22; Psalm 46; Revelation 20:1-6; Revelation 21:1-4 Date: 1999 Subject: Anniversary of a Church | ; Festal Joy | ; Intercession of the Church | ; Jerusalem | ; People of God | ; Saints Days and Holy Days | St Peter; Saints Days and Holy Days | St Simon and St Luke; Worship | Earthly and Heavenly; Worship | Processional Entrance Source: Urbs beata Hierusalem, Latin, c. 7th cent. Display Title: Christ Is Made the Sure Foundation First Line: Christ is made the sure foundation Tune Title: WESTMINSTER ABBEY Author: John M. Neale, 1818-66 Meter: 87 87 87 Date: 2007 Subject: Redeemer | Source: Latin hymn, c. 8th cent., ar.